A short biography of the anarchist militant and dancer Pietro Valpreda who was caught up in the Strategy of Tension. Pietro Valpreda was born in Milan in 1933. At the beginning of the 1960s he began to frequent anarchist circles in Milan and Rome. He worked as a dancer in theatrical reviews. In 1968 along with younger comrades he set up an anarchist group named after the French 22nd March movement. The group employed incendiary and provocative language, distancing itself from the organised anarchist movement. During a demonstration in 1969 it chanted “Bombs, blood, anarchy”. Valpreda and others published the duplicated magazine Terra e liberta which sang the praises of propaganda by deed anarchist Ravachol. The anarchist group of Ponte della Ghisolfa in Milan distanced themselves from him as did the Italian Anarchist Federation (FAI) in Rome who regarded the March 22nd group as hotheads. In this period of the counter-insurgency Strategy of Tension the police were able to infiltrate the police agent Salvatore Ippolito into the groupuscule, which was also infiltrated by neo-Nazis like Mario Merlino. On the 12th December 1969 Valpreda was visiting his aunt. On that day a bomb exploded in the Piazza Fontana at the Agricultural Bank, killing 16 and wounding 88. Three other bombs exploded in Rome at the same time wounding 14. On the 15th , Valpreda, appearing in court for insulting the Pope, was arrested for these explosions. On the same night, the anarchist railway worker Giuseppe Pinelli, was also arrested for these bombings and "fell" from the 4th floor of the Milan police station. The bombs had been planted by fascists, with the involvement of the security services, as a move in the Strategy of Tension - a plot to discredit anarchists and working class organisations by carrying out terrorist attacks and blaming them. The anarchists and in particular Valpreda and his groupuscule were prime targets for a frame-up. The Italian press had a field day describing the totally innocent Valpreda as a monster. The Milanese anarchist movement courageously responded by holding a press conference the following day and proclaiming his innocence. This set off a vast campaign in Italy and internationally to fight for his release. There were thousands of actions and a counter-information campaign that was both effective and widespread. Valpreda became a symbol, like Sacco and Vanzetti had many years before. In 1972 Valpreda was released from prison. For a long time, the false accusations and imprisonment had a devastating effect on his life. Then he met Lauretta, and they had a son, Tupac. The hearings dragged on, at Rome, then Catanzaro and then Rome again. Pietro received the strong support of a new partner, Pia. 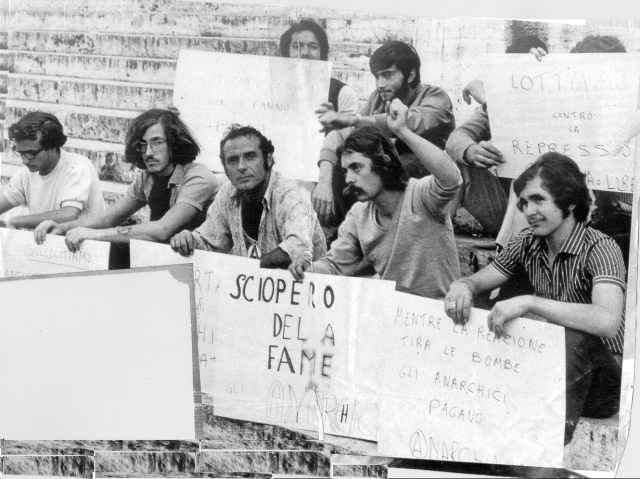 Then in 1979 Pietro was cleared by a court and took part in hundreds of conferences, public debates and television interviews. Imprisonment had aggravated the Buerger’s disease that he suffered from, and he was no longer able to continue his career as a dancer. For a while he was a bookseller and then opened the Barricata café in the working class neighbourhood of Garibaldi in Milan. He continued to circulate in the anarchist movement, to attend demonstrations - above all that on every 15th December organised by the Ponte dell Ghisolfa Anarchist Circle to remember the murder of Pinelli. In his last years he wrote 4 novels; earlier he had written a book of poetry at the time of his detention. The first Tri di a luii was published by the Ponte della Ghisolfa group. The other 3, co-written with Pietro Colaprico were brought out by Tropea Editions. His health began to deteriorate and he died after long illness of cancer on 6th July 2002. Pietro’s funeral was organised by the Ponte della Ghisolfa group which on 8th July set off from the anarchist local followed by 3,000 people flying anarchist flags. Classical music and jazz were played at Pietro’s request as well as anarchist songs before his body was cremated. Pietro refused to be a passive victim of State repression and throughout his long ordeal he discovered within himself reserves of strength which gave him a proud and dignified appearance and comportment. His affirmation of what it is to be an authentic human being is in stark contrast to the squalid machinations of the Italian State and its secret services.